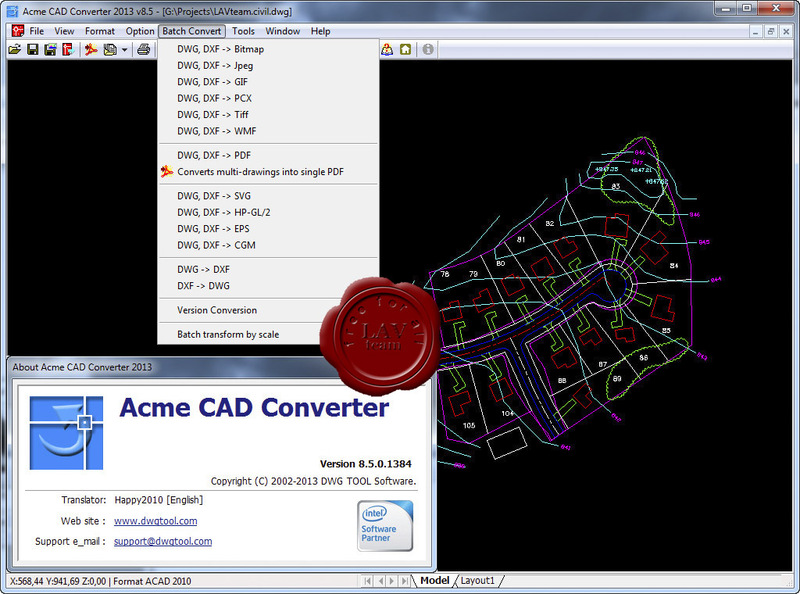 Acme CADConverter is a format conversion software for batch and vector files. It can conveniently convert DXF,DWF and DWG files into BMP, GIF, JPEG, WMF, PCX, TIFF, PNG, TGA, DXF, DWG, SVG, SVGZ, CGM, EPS, PDF, HPGL(PLT,HGL) etc., and also enable the conversion between DXF and DWG file versions (AutoCAD R2.5-R2008).Supports replace font file. Supports Transmit command like AutoCAD,and batch recover drawing files. Can export layers of DWG file to the layers of PDF file and Can export OLE entity to PDF file.